This book focuses on computational methods for large-scale statistical inverse problems and provides an introduction to statistical Bayesian and frequentist methodologies. Recent research advances for approximation methods are discussed, along with Kalman filtering methods and optimization-based approaches to solving inverse problems. The aim is to cross-fertilize the perspectives of researchers in the areas of data assimilation, statistics, large-scale optimization, applied and computational mathematics, high performance computing, and cutting-edge applications. The solution to large-scale inverse problems critically depends on methods to reduce computational cost. Recent research approaches tackle this challenge in a variety of different ways. Many of the computational frameworks highlighted in this book build upon state-of-the-art methods for simulation of the forward problem, such as, fast Partial Differential Equation (PDE) solvers, reduced-order models and emulators of the forward problem, stochastic spectral approximations, and ensemble-based approximations, as well as exploiting the machinery for large-scale deterministic optimization through adjoint and other sensitivity analysis methods. 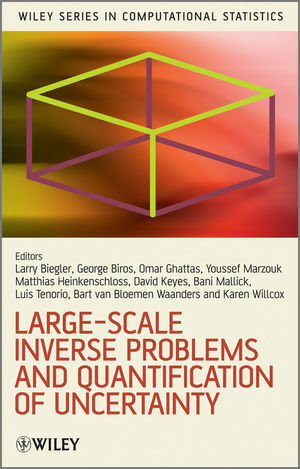 Brings together the perspectives of researchers in areas of inverse problems and data assimilation. Assesses the current state-of-the-art and identify needs and opportunities for future research. Focuses on the computational methods used to analyze and simulate inverse problems. Written by leading experts of inverse problems and uncertainty quantification. Graduate students and researchers working in statistics, mathematics and engineering will benefit from this book. Lorenz Biegler, Carnegie Mellon University, USA. George Biros, Georgia Institute of Technology, USA. Omar Ghattas, University of Texas at Austin, USA. Matthias Heinkenschloss, Rice University, USA. David Keyes, KAUST and Columbia University, USA. Bani Mallick, Texas A&M University, USA. Luis Tenorio, Colorado School of Mines, USA. Bart van Bloemen Waanders, Sandia National Laboratories, USA. Karen Wilcox, Massachusetts Institute of Technology, USA. Youssef Marzouk, Massachusetts Institute of Technology, USA. 2.2 Prior Information and Parameters: What do you know, and what do you want to know? 2.3 Estimators: What can you do with what you measure? 2.4 Performance of estimators: How well can you do? 15.2 Traveltime inversion for velocity determination.